The year is 2013. The day is Sept. 11. I’m walking down the hallways of Lanier Middle School in Fairfax, Virginia, with a smile so radiant, it would blind the sun. Nothing could ruin my mood. I’m holding my “Happy Birthday” balloons on my way to see how much my friends outdid themselves with my perfectly decorated locker. Nothing could ruin my mood. I’m thanking my friends who roam the halls, the random strangers hurrying to class and the staff members arriving to work for the vibrant birthday wishes. Nothing could ruin my mood. I get to my locker and am pleasantly greeted by the colorful kindness of my friends. Nothing could ruin my mood. That did ruin my mood. I whipped my head around to see a male student smirk at me, confidence gleaming in his eyes from the venom he just spat at me. That boy said those words out of ignorance, hate and a lack of understanding. Not understanding that his words cut through me like a knife. Not understanding that his uneducated behavior stemmed from the hate his parents taught him. Not understanding that just because I’m Muslim, doesn’t mean I lack emotion. That day, I got a taste of the pure disrespect Muslims have to tolerate in this world. On March 15, 50 Muslims were killed and 50 more injured in New Zealand in a hate-filled terror attack at two mosques during Friday prayer. A 28-year-old white Australian man shot up two mosques in an attack on the Muslim community. Yet another attack. Yet another disaster. Yet another heartbreak. Saffeya Ahmed, managing editor of The Commonwealth Times, wrote a story on the attacks in Christchurch, New Zealand. Her story embodied such heart, emotion and pain — I have never felt so much grief while reading something. It was powerful, honest and unapologetically Muslim. To say her article brought me to tears would be a grave understatement. I was struggling to breathe as Saffeya explained the forgiveness and peacefulness expressed by our brothers and sisters in Islam. 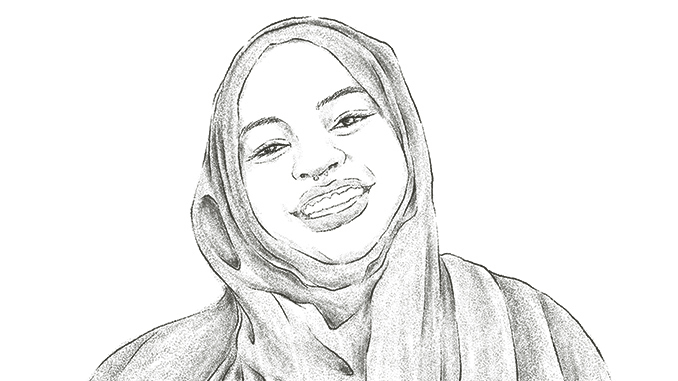 Thank you, Saffeya, for being our voice. For as long as I can remember, I’ve been afraid of the way people perceive me for being Muslim. I’m a black Muslim woman. I didn’t choose to be black, but I’m proud to be it. I didn’t choose to be a woman, but I’m proud to be it. I CHOOSE to be Muslim, and I’m proud to be it. I’m fed up with these extreme liberals and conservatives claiming they are helping “liberate” me by telling me: to renounce my religion, the hijab is a form of oppression, Islam is misogynistic, my religion preaches violence. Let me set the record straight right now: I CHOOSE to wear the hijab. The hijab empowers me. It lets me showcase my religion, while also allowing my beauty to shine from within. Islam has taught me to love being a woman, to see the strength that the woman wields — her braveness and necessity to society. My religion preaches peace, togetherness and admiration. I CHOOSE to be Muslim. Western propaganda claims Islam is violent. I dare those buying into the Western influence to say that to the victims and their families in New Zealand, London and the thousands of other places where attacks on the Muslim community have taken place. Stop condemning an entire religion for the mistakes of few. Don’t blame me for things I had absolutely no part of, that my family had no part of, that the real Muslim community had no part of. When people like Dylann Roof, the shooter at a church in South Carolina, and Devin Patrick Kelly, another shooter in Texas, killed nine and 26 people, respectively, they were branded “lone wolves.” But when Syed Rizwan Farook and his wife, the San Bernardino bombers, do the same, all Muslims are suddenly terrorists. Don’t twist my words: none of these people are innocent. They deserve their punishments, and then some. However, Muslims are still being punished for the crimes of Farook, Tashfeen Malik and even Bin Laden. The crimes perpetrated by these men repulse and devastate the Muslim community as much as the next person. It baffles me that some people actually believe Muslims sit back with no concern for these murders. Let’s not forget Muslims were also victims of these attacks. Stop vilifying Muslims for the attacks of others. Every day, I see Muslims disrespected and hated. The president tried to ban my entire religion from entering the U.S. when he signed an executive order banning nationals from seven predominantly Muslim countries. It wasn’t some sort of elaborate scheme — he outright said he wanted to ban Muslims. And, the craziest thing was that thousands of Americans supported it. These are Americans who know Muslims, live near Muslims, work with Muslims. Because in the end, Muslim-Americans are just as American as everyone else in this great country. My parents pay taxes, same as yours. My siblings go to public school, same as yours. I love my country, same as you. I was born in this country. I was born on Sept. 11, 2000. No, Osama Bin Laden did not do it to honor me. No, I’m not a terrorist. No, I don’t hate my religion. No, I was not forced to wear my hijab. No, I’m not embarrassed of my religion. I am an American. I am Muslim. I am a Muslim-American. And I’m proud of it.